King Salmon aka Chinook Salmon are native to the Northeaster Pacific Coast. 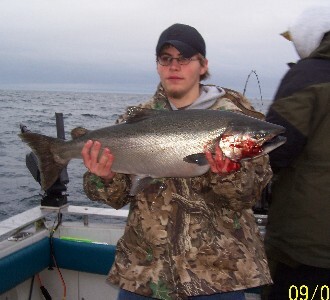 The are great sport fish and have now been successfully introduced to the Great Lakes. The Great Lakes are freshwater lakes and the salmon do fine despite the fact that they naturally live in the ocean until it is time to spawn. As you can see from the photo the get to be fair sized and this one isn't even approaching the upper weight limit. The have been known to weigh as much as 130 pounds.